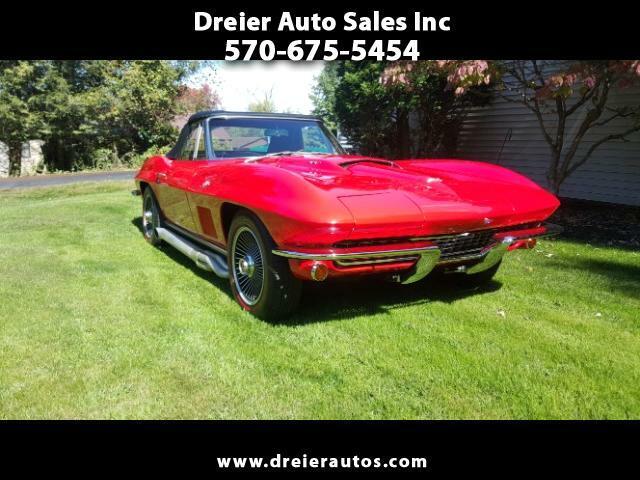 Restored C2 1967 Chevrolet Corvette in very nice condition. The original engine was replaced with a 454 cu in engine just after the present owner purchased the vehicle.The car has undergone numerous upgrades and refurbishing of critical components including steering, suspension, brakes, drive line, rear diff, interior and electrical components. I am representing this vehicle for an old friend who has been a hot roder since the 50's. The engine has square port heads, 9.5 pistons a mild cam upgrade. It has been professionally rebuilt by a well respected local machine shop specializing in high performance builds. At that time the instrument cluster was replaced with a new odometer reading 00000 to correspond to the restoration. Unfortunately in 1994, not imagining he would ever sell his dream car my friend never recorded the mileage shown at the time because the old unit was inop. It doesn't much matter because the vehicle is being represented as not actual mileage although he felt that the miles were well under 100,000. The car is a real beast and therein lies the problem for my friend. He has finally realized he is too slow reacting for a real hand full of C2 Corvette. We just tuned it, added 4 degrees cam advance and a new 750 CFM carburetor to get rid of a stumble. It pulls strong. It is time to move on, so please contact me on my cell at 570 574 5455, I can put you in touch with the owner and we can arrange for an inspection. Message: Thought you might be interested in this 1967 Chevrolet Corvette Sting Ray .